I remember sitting down with my friend at the beginning of 2016, opening up to her about my depression and anxiety. It scared me because I didn’t know where it came from, why I had it, and when it would go away. Months later, and thanks to lots of discussions with family members, doctors, my significant other, and friends, I’ve realized it’s been a part of me for a very long time, that it’s in my family, and that, ultimately, I am not crazy. Faking it. It was so hard to hear out loud, but so true. I was able to get out of bed every morning, work out, shower, put makeup on, nice clothes, smile to passersby, get my work done, cook dinner for my partner, have a night out with friends. On the outside, I didn’t look anxious or depressed at all. But no one knew that there were moments that I was staring at everyone else trying to simply mimic their comfort, ease, and happiness. They didn’t know all I saw was grey. They didn’t know it felt like I had a lead vest on. They didn’t understand that, in the middle of a conversation with someone, suddenly I’d feel overwhelmed and displaced, sweat dripping from my clenched palms, a burning heat accumulating at the nape of my neck, a tingling sensation in my feet, a weakness in my knees, and the uncontrollable feeling that at any second I was either going to scream or faint. I have, undoubtedly, been frightened by my anxiety and depression. And while it may be a part of me, it certainly doesn’t define me. However, I have realized, through my own acceptance, that mental disorders are largely overlooked, and it’s not okay. Depression affects nearly 350 million people worldwide, and anxiety disorders are the most common mental illness in the U.S.. The reason I link the two so closely is because they are just that: connected. It’s not uncommon for someone with depression to also suffer from anxiety, and vice versa. In fact, nearly one-half of those diagnosed with depression are also diagnosed with an anxiety disorder. Anxiety and depression have many faces, but sometimes, if not often, they go unnoticed, because people have the high-functioning sorts. But these disorders are largely misrepresented by ads and pop-culture portrayals, which only show one side of the equation: the ones that are easy to see, like intense crying, sleep deprivation, and withdrawal from friends and activities. But as I’ve noted, there are other faces, too. 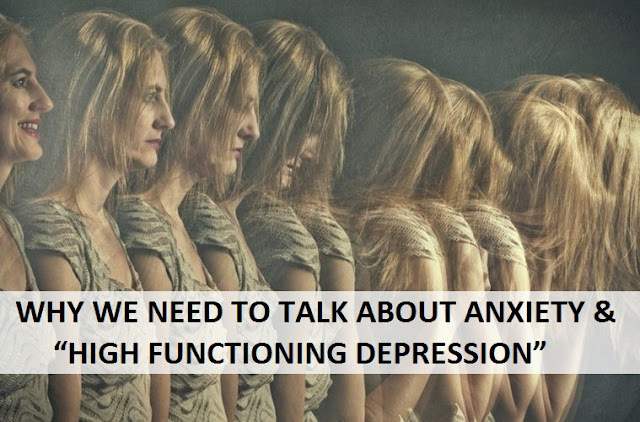 Depression and anxiety look like comedian Sarah Silverman, superstar Beyonce, bubbly actress Kristen Bell. It looks like the freelance writer who doesn’t have to report to a nine-to-five job and often times writes from the beach. It looks like your strong, independent and beautiful best friend who’s the first to make it to the top of a mountain and the last to leave a party. It’s your newly-engaged friend, it’s your just-promoted colleague. Someone with high-functioning depression and anxiety may seem to have it all together on the outside, but things are erupting on the inside. Carol Landau, PhD, a clinical professor of psychiatry and human behavior and medicine at Brown University, accounts for the high-functioning kinds existing dominantly in women with a need for perfection; those same people who you admire for seemingly having it all together, and having a smile from ear-to-ear all the while. I don’t know if it’s a matter of one being less of an issue than the other, but I do think it’s about understanding.So what can you take away from this? How to be conscious of someone who does have anxiety and depression. Know the signs beyond what you see on an ad, be sensitive to slight changes in someone’s behavior, and reach out to them. I opened up to my significant other about my struggle, and though scary, I have found the benefit of it. A gentle rub on the back and words of comfort and positivity when he notices me getting squirmy have made all the difference. But he would have never noticed if he didn’t educate himself. If you have anxiety or depression, talk about it. If you think someone has anxiety or depression, talk about it.